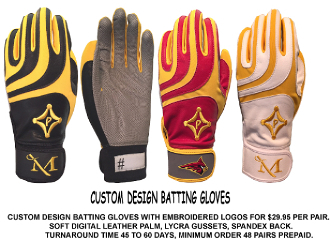 CUSTOM DESIGN BATTING GLOVES WITH EMBROIDERED LOGOS. SOFT DIGITAL LEATHER PALM, LYCRA GUSSETS,SPANDEX BACK. TURNAROUND TIME 45 TO 60 DAYS FROM PREPAYMENT. MINIMUM ORDER 24 PAIRS PER TEAM. PLEASE CALL FOR INSTRUCTIONS. 410-922-6725 OR EMAIL AT CWEBSTER@PALMGARD.COM.